I'm looking to put my collection in a glass-sided display cabinet for safety reasons. I teach music lessons out of my home, and don't trust my students when they're upstairs waiting for their lesson to begin or waiting for their parents to pick them up. Do any forumites display their collections in lockable cabinets? If so, would you mind posting pics or talking about the design? I may end up making one if I can't find a pre-built or affordable custom cabinet. So far, I haven't found any others that can fit my criteria, and am saving money for the Browning display case. For your purpose a simple wood-and-glass gun display case with a basic lock might do. Mac mentioned that he had a real nice display case on order; hopefully he can shed some more light on this issue. You can easily invest more money in your display cases than you spent on the swords themselves. Gun cases that look good are very expensive, and usually are not large enough to display more than six or eight items total. The suppliers of store display fixtures might be able to provide you with larger glass or plexiglas cabinets, but the plexiglas type especially will give you sticker shock. If you can make friends with a cabinetmaker in your area you may at least be able to design a wall mounted cabinet that fits your needs exactly. But It calls for some tool that I don't have and don't know that I'd use again, and don't have room to store even if I did think I'd use them again. I may build a very basic glass-sided box and slide my current display stand into it. It's less complicated, and only requires me to buy a router and router table. If you're at all handy in the woodworking area I'd strongly suggest buildning your own. It's hard to find one that looks right with swords, most are far too modern looking. The one that Mac has purchased look very nice, but the mirroe back had to go, IMHO. Every one I've seen has that feature. The only ones I've found that don't are antiques that I wouldn't feel comfortable drilling and nailing into. 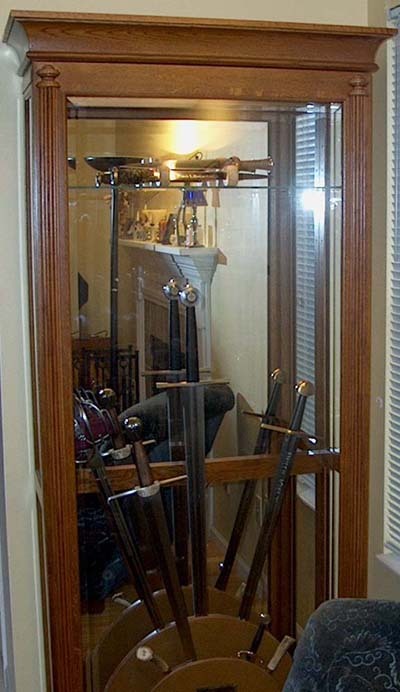 I don't keep my swords in a cabinet, although I do lock them in the gun safe if we're going out for more than an evening or afternoon. Remember, these glass fronted display cases are useless in terms of true security, but they will stop curious fingers which seems to be what you're after. 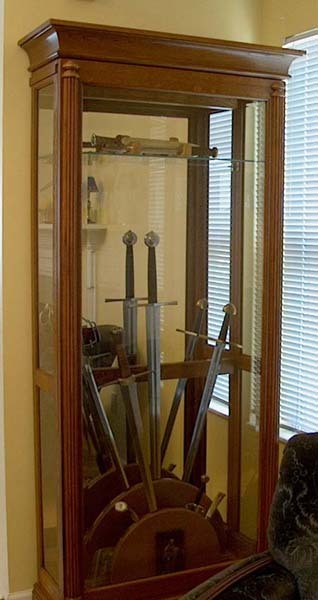 As an aside, if you decide to build your own how about writing us an article on building your own sword cabinet? That would make a nice addition to our features. For an inexpensive (and not overly secure) case, you can buy an Ikea Bookshelf with glass doors and install a lock on it. There is a shelf that divides the middle of the book-case that you can cut several slots across it's length to slide the blade through. A lot of lowes and home depot's carry pre milled wood pieces for cabinets and stuff now, you could probably build a variant of the popular mechanics gun rack with a very minimal investment in tools. I don't care for the etched deerhead either, not for housing swords, though I might get one like it to display my old (OLD) Marlin 336 and O/U Shotguns. Somehow deerhead looks appropriate there. I e-mailed MortonBooth and asked them if a cabinet could be ordered sans deerhead. Will advise as soon as I hear from them. It would be very easy either to convert a few shelves of an existing bookcase or build a custom cabinet. All you'd need for the latter is a hand saw, hammer and nails (screws hold tighter). I have my little collection temporarily displayed two-to-a-shelf at the bottom of some built-ins, and it would be very simple to get a large sheet of plexiglass, hinge the top or bottom (you'd need a drill) and add a lock. Plexi's easy to cut to size, drill, etc. and is MUCH lighter than glass. Now that I think of it, I may do this when my niece and nephew are old enough to start rummaging around in the library. 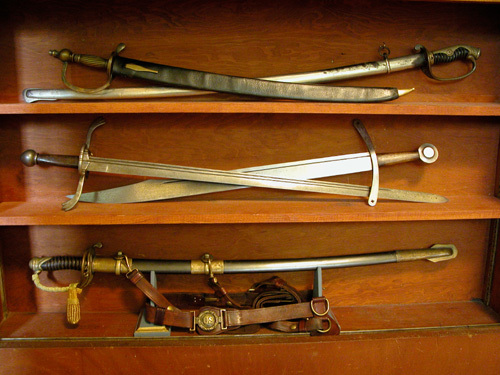 By the way, those swords that don't "sit up" well on their own can be supported/secured by ordinary brass cup hooks. Several of those pictured below are supported by hooks. The Leech & Rigdon "floating CS" sword is on two supports made from craft wood and the little plaques you can get for a dollar at Hobby Lobby or other craft stores. Those make perfect display bases. I found and bought this curio. It works well for my current collection and offers me the space to expand the collection a little bit. The front slides halfway in either direction for access. Another shot, if anyone is interested. Chad, that looks great. I especially like how there are glass sides to the case, allowing an easier viewing experience with added light. I'm pretty happy with it. I was going to build one, but this was much easier , and not much more expensive once you factor in buying tools and materials. I may put an actual lock on it, but it isn't easy to open now unless you know how to do it.